"In Thee" / "Lonely Teardrops"
"In Thee" / "The Vigil"
"You're Not the One (I Was Looking for)" / "Moon Crazy"
Mirrors is the sixth studio album by U.S. hard-rock band Blue Öyster Cult, released on June 19, 1979. Mirrors was the first BÖC album not produced by long-time producer and manager Sandy Pearlman. The album features a collaboration with British fantasy/science-fiction author Michael Moorcock, who co-wrote a song based on his novel The Fireclown. "The Great Sun Jester" is the first of several Moorcock co-writing credits with the band. After the success of 1976's Platinum Agents of Fortune, 1977's Gold Spectres and 1978's Platinum live effort Some Enchanted Evening, the fact that Mirrors struggled to reach Gold status disappointed band and label alike. According to interviews with the band and production staff, the intent for this album was to make a high-charting record with glossy production; however, the backlash from this attempt led to the band's future pairing with Martin Birch and an attempt to return to a darker sound. Acoustic ballad "In Thee," written by Allen Lanier, went into the charts at No. 74. The line "Jim says some destinies should not be delivered" references the Jim Carroll Band song "Day and Night." Mickey Raphael – harmonica on "Dr. Music"
Jai Winding – strings on "In Thee"
^ Ruhlmann, William. 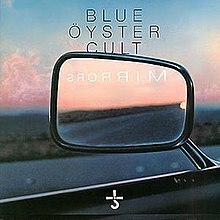 "Blue Öyster Cult - Mirrors review". AllMusic. Rovi Corporation. Retrieved January 19, 2012. ^ Popoff, Martin (October 2003). The Collector's Guide to Heavy Metal: Volume 1: The Seventies. Burlington, Ontario, Canada: Collector's Guide Publishing. p. 55. ISBN 978-1894959025. ^ Schneider, Mitchell (November 29, 1979). "Album Reviews: Blue Oyster Cult – Mirrors". Rolling Stone. Archived from the original on September 15, 2008. Retrieved April 9, 2012. ^ a b "Blue Öyster Cult Chart History: Hot 100". Billboard.com. Billboard. Retrieved September 2, 2018. ^ "Blue Öyster Cult Chart History: Billboard 200". Billboard.com. Billboard. Retrieved September 2, 2018. ^ "Blue Oyster Cult Official Charts". Official Charts Company. Retrieved April 22, 2018. ^ "Top Albums/CDs – Volume 31, No. 24, September 08 1979". Library and Archives Canada. September 8, 1979. Retrieved January 19, 2012. This page was last edited on 4 April 2019, at 19:15 (UTC).